One of my cardinal rules of collecting is, “don’t buy it unless you know what it is!”. Like most rules, it was made to be broken… so I went ahead and purchased the large, banana shaped lovebird flower bowl. The pressed glass bowl, with its grey wash reminded me of Rene Lalique’s works of the 1920s. I figured the bowl was of undetermined French origin- but I liked it. Though the bowl remained in Centralia Square for many months, it took awhile before I finally broke down and bought it. Imagine my surprise when I found a copy of [the now out of print and hard to find] book Phoenix and Consolidated Art Glass, 1926- 1980 by Jack Wilson and I discovered my bowl pictured in it! It wasn’t French, it was American, having been made in the 1920s by Consolidated Lamp and Glass Company. Naturally I was pleased when the book valued my piece several times over the purchase price. More importantly the book explained the link between French and American art glass. Already being a Lalique collector, I was soon hot on the trail for more Phoneix and Consolidated. Founded in the late 1800s, both Phoenix and Consolidated produced lamp globes and shades for a rapidly electrifying nation. By the 1920s, though, lighting had ceased to be a growth industry, and both companies sought to diversify. It was the 1925 Paris Exposition Internationale des Artes that inspired Consolidated to enter the giftware field. The exposition was dominated by works by Rene Lalique, leader of the Art Moderne movement. In 1926 Consolidated introduced the ‘Martele’ line, imitating the Lalique style. Designer Reuben Haley also copied the Lalique ‘Lovebird’ design exactly; but all other Consolidated designs were original. 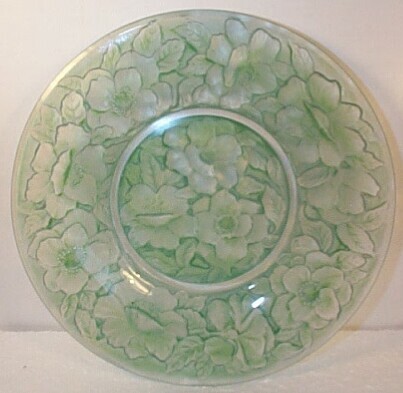 Initially, ‘Martele’ was advertised as Lalique reproductions. Consolidated’s most popular designs were introduced between 1926 and 1929 and were very diverse. ‘Catalonian’, with its free form designs in bubble or blister glass, was advertised as the “glass of old spain”. ‘Ruba Rombic’ offered geometric designs without parallel lines, and was called “an epic in modern art”. In 1937, Reuben Haley’s son Kenneth designed a luncheon set revived the ‘Martele’ dance of the nymphs. When the great depression closed Consolidated’s plants in 1933, their most popular molds were lent to the Phoenix Glass Co., where production continued under the name “Phoenix Reuben-Line”. The molds were returned to Consolidated in 1936; but in the meantime, Phoenix developed it’s own line of giftware called ‘sculptured art glass’. Like Consolidated’s ‘Martele’, the sculptured line emphasized natural motifs; birds, insects, and flowers. Both companies maintained production throughout the 1960s. Consolidated’s plant closed after a major 1964 fire; in 1970, Phoenix was acquired by Anchor Hocking. Production of the sculptured line continued until 1978, when a fire destroyed the plant. 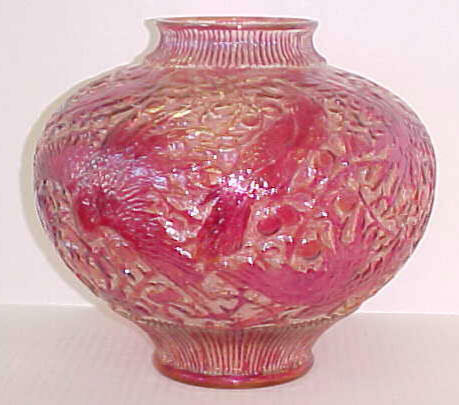 A commemorative vase in a limited edition of 2,000 was made upon reconstruction of the plant.